JOHANNESBURG, South Africa (CNN) -- South Africans voted Wednesday in elections that the ruling African National Congress is expected to win in a landslide. 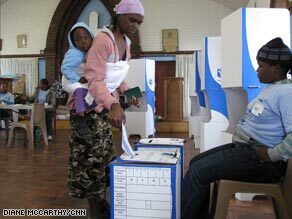 A woman votes in a church in Soweto during Wednesday's elections. But the ANC, led by Jacob Zuma, could see its two-thirds parliamentary majority reduced by the country's numerous opposition parties. The ANC has increased its share of the vote in every election since the end of apartheid in 1994. Leading the opposition challenge is Congress of the People, or Cope; a breakaway faction of the ANC which has capitalized as the ANC has been dogged by corruption and accused of failing to deliver services to the poor. "People are taking this election very seriously," said CNN's Robyn Curnow. Voters stood in line for hours after a slow start, blamed partly on cold weather. Polling stations closed at 1900 GMT but anyone in line at the time was allowed to vote. The Independent Electoral Commission said the sheer number of people voting created long lines and a shortage of ballot boxes and papers in some districts and voting stations. The ANC's prospects have not been helped by the controversial election of Zuma to the party leadership last year. Until early this month, Zuma, who is practically the country's president-in-waiting, was facing fraud and corruption charges. The charges were dropped two weeks before the elections because of alleged political interference in his case. That decision by the country's prosecuting authority sparked widespread outrage, with opposition parties accusing prosecutors of buckling under political pressure. But the ANC continues to command widespread respect and support among ordinary South Africans for its role in the struggle against apartheid and most consider the party of Nelson Mandela their political home. In an effort to shore up support for the ANC, the 90-year-old Mandela shared the stage with Zuma at the party's final pre-election rally in Johannesburg on Sunday. First-time voter Lucas Nomblelani, a young black South African sporting the purple ink on his thumb that proved he had cast his ballot, said he found it hard not consider what the ANC had done for the country. "Those people -- they fight for us," he told CNN. "I'm here, I can vote. I don't have the soldiers here to force me to do something." He adds, "Now we are free, all of us, to do what we want to do. It's my choice to vote today." Launched in December, Cope is made up of former ANC members who quit following ANC's sacking of Thabo Mbeki as the country's president. "It is a baby with teeth. We can bite and I do believe the people of South Africa have heard our message," Cope presidential candidate Mvume Dandala said Wednesday, according to Reuters.com. Zuma, who is widely expected to be the country's next president, has already pledged his party will use its predicted majority responsibly and maintains he is innocent of corruption allegations. In the past 15 years, the ANC has built 2.8 million houses and provided running water, sanitation and electricity to the poor. South Africa boasts a robust constitution and the strongest economy on the continent. Yet more than 1 million people still live in shacks, and the newly constructed homes have been found to be substandard, with many falling apart even before being handed over to beneficiaries. Queuing up to vote in Soweto, Lulu Makapela said many people were disappointed by the ANC's failure to deliver on promises to deliver better housing, education and jobs. Violent crime has also escalated. Last year, nearly 50 people were killed daily, according to police. And though South Africa won the bid to host the Football World Cup in 2010, many say that the billions that are being spent on the tournament could be better used to lift the lives of the needy. CNN's Nkepile Mabuse in Johannesburg and Robyn Curnow in Soweto contributed to this report.